A Utah police department is thinking about getting rid of its body cameras. Residents — including the families of people shot by officers — are rallying against the idea. 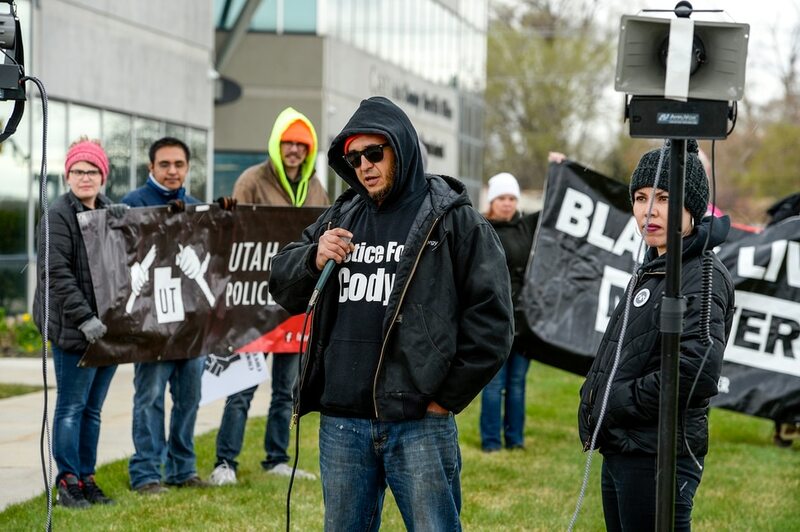 Leah Hogsten | The Salt Lake Tribune Brown Beret member Carlos Martinez, right, joined members of Utah Against Police Brutality to demonstrate outside the Salt Lake County Sheriff's office prior to Unified Police Department's public hearing, April 10, 2019 on whether its officers should continue wearing body cameras. Utah Against Police Brutality were demanding that the council move to equip every UPD officer in the field with a body-cam to protect all the people they interact with, for both principled and practical reasons. Leah Hogsten | The Salt Lake Tribune Marvin Oliveros, stepbrother to Cody Belgard, who was shot and killed by Salt Lake police on Nov. 9, 2018 and members of Utah Against Police Brutality demonstrate outside the Salt Lake County Sheriff's office prior to Unified Police Department's public hearing, April 10, 2019 on whether its officers should continue wearing body cameras. Utah Against Police Brutality were demanding that the council move to equip every UPD officer in the field with a body-cam to protect all the people they interact with, for both principled and practical reasons. 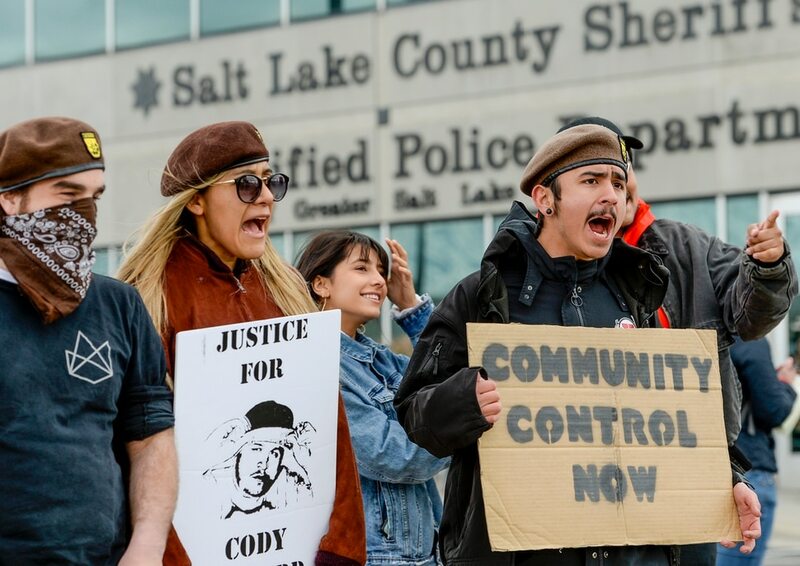 Leah Hogsten | The Salt Lake Tribune Jacob Jensen with Utah Against Police Brutality rallies demonstrators outside the Salt Lake County Sheriff's office prior to Unified Police Department's public hearing, April 10, 2019 on whether its officers should continue wearing body cameras. Utah Against Police Brutality were demanding that the council move to equip every UPD officer in the field with a body-cam to protect all the people they interact with, for both principled and practical reasons. Leah Hogsten | The Salt Lake Tribune l-r Jeff Adams, Janee Gillette and her sister Michele Miller joined members of Utah Against Police Brutality to demonstrate outside the Salt Lake County Sheriff's office prior to Unified Police Department's public hearing, April 10, 2019 on whether its officers should continue wearing body cameras. I recognize my white priviledge, said Janee Gillette. It's up to the majority to correct this injustice. Utah Against Police Brutality were demanding that the council move to equip every UPD officer in the field with a body-cam 'to protect all the people they interact with, for both principled and practical reasons.' Leah Hogsten | The Salt Lake Tribune Members of Utah Against Police Brutality demonstrate outside the Salt Lake County Sheriff's office prior to Unified Police Department's public hearing, April 10, 2019 on whether its officers should continue wearing body cameras. Utah Against Police Brutality were demanding that the council move to equip every UPD officer in the field with a body-cam to protect all the people they interact with, for both principled and practical reasons. Leah Hogsten | The Salt Lake Tribune The camera can't lie, said Gina Thayne, aunt of Dillon Taylor, who was shot and killed by a Salt Lake City police officer in 2014 outside a South Salt Lake convenience store. 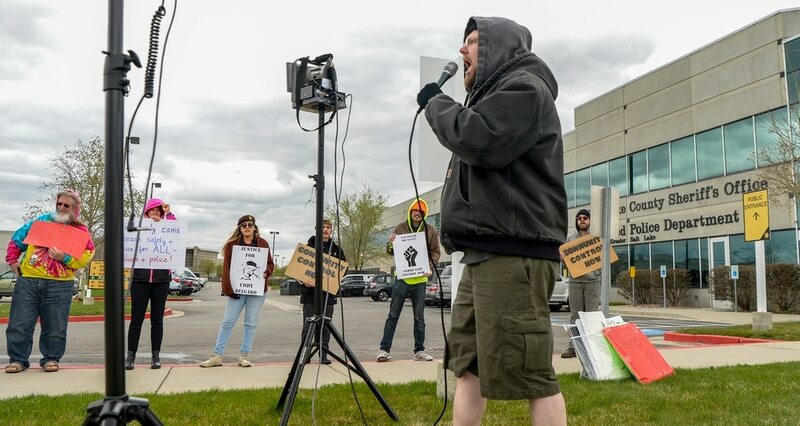 Thayne and members of Utah Against Police Brutality were outside the Salt Lake County Sheriff's office prior to Unified Police Department's public hearing, April 10, 2019 on whether its officers should continue wearing body cameras. Utah Against Police Brutality were demanding that the council move to equip every UPD officer in the field with a body-cam to protect all the people they interact with, for both principled and practical reasons. Leah Hogsten | The Salt Lake Tribune Maren Caldwell snaps her fingers to show support for comments she agrees with during the meeting. The Unified Police Department held a public hearing, April 10, 2019 on whether its officers should continue wearing body cameras. Leah Hogsten | The Salt Lake Tribune l-r Maren Cauldwell, Larene Orgill and Sierra Palmer with Black Lives Matter react to public comment during the meeting. The Unified Police Department held a public hearing, April 10, 2019 on whether its officers should continue wearing body cameras. Leah Hogsten | The Salt Lake Tribune Several Unified police officers attended the meeting. The Unified Police Department held a public hearing, April 10, 2019 on whether its officers should continue wearing body cameras. Leah Hogsten | The Salt Lake Tribune l-r Salt Lake County Sheriff Rosie Rivera and Harry Souvall, chief legal counsel with Unified Police Department address the board members. The board of Unified Police Department held a public hearing, April 10, 2019 on whether its officers should continue wearing body cameras. Leah Hogsten | The Salt Lake Tribune Evan Peterson, right, told the board that body camera increase accountability and public trust. The Unified Police Department board held a public hearing, April 10, 2019 on whether its officers should continue wearing body cameras. Leah Hogsten | The Salt Lake Tribune Members of the Unified Police Department listen to citizens during a public hearing, April 10, 2019 on whether its officers should continue wearing body cameras. The first time Marvin Oliveros watched the video that shows officers fatally shooting his brother, it was on a small computer screen at the Salt Lake City police station. His parents couldn’t bear to come down there. His sister was with him, but before the bullets sounded, she walked out of the room. Oliveros sat through the entire recording alone and, when it was over, he cried. His brother, Cody Belgard, was 30 years old and did not have a gun when he was approached by officers after a confrontation on Nov. 9. But one of the worst parts for Oliveros is that when he saw the footage, Belgard appeared to have his back turned as he was struck. Of the hundreds of times he’s watched it since then, he’s focused on that. Oliveros joined a group of about 50 residents Wednesday night — including other family members of people shot by officers in Utah — to speak to the board of directors for Unified Police Department. It’s one of the biggest police forces in the state. And it’s considering whether to discontinue its use of body cameras because of the high cost. “A big part of the evidence we’re relying on in our case is the body cam footage,” Oliveros told the nine members of the governing board who sat at the front of the room. It’s what prosecutors are using to determine if the officer was legally justified to use deadly force against Belgard, which has not yet been determined. Or if Oliveros’ brother was shot without reason. The department first met in February to discuss possibly eliminating the cameras and tabled the issue so it could hear from the public. At the hourlong meeting Wednesday, 20 people lined up behind the microphone. They shared testimonies of interactions with police that didn’t go well. They argued that cost shouldn’t be the main consideration. They wore shirts and buttons with the faces of Utahns killed by police in past years, including Belgard and Darrien Hunt. And they talked about how the cameras create a sense of public trust. Many who spoke were people of color — whose communities are statistically most likely to be affected by police brutality. A driver chased by a Utah County deputy over a registration violation ran a red light and killed someone. Now the sheriff’s office may change its pursuit policy. Some kids have been navigating Utah’s court system alone. But lawmakers passed a measure that will provide all youths with a lawyer. “Will we have a comment period for the handguns carried by police?” asked Cristobal Villegas. After each person finished, the crowd snapped their fingers in support. The back two rows of the auditorium at UPD’s headquarters were filled with officers. In 2017, the department outfitted 125 of its 410 officers with body cameras. The force was able to pay for that, in part, with the help of a grant that expires in three years. It has already funded $146,000 toward the costs. But UPD has had to pay an additional $348,000 for the cameras and data storage. The board of directors, as it prepares a budget, is now weighing whether it should get cameras for every officer, continue covering that 30 percent or eliminate them altogether. Those who attended the meeting Wednesday held a rally outside before it started. As it rained lightly, they chanted “Body cams now!” The group, led by the advocacy organizations Utah Against Police Brutality and Black Lives Matter, is calling for all officers on the force to wear a body camera. They say that would hold police agencies more accountable for their actions, safeguarding officers from fake allegations and residents from improper force. According to a report presented to the board of directors, that would cost more than $450,000 per year. “You can look at both the financial cost and human cost,” said Jason Groth, a justice coordinator for the ACLU of Utah. “And you’re saving costs by not spending days in court” to litigate cases of deadly force. Since UPD officers started using cameras, there have been more than 1,600 cases of use of force; 23 of those have resulted in complaints with seven involving body camera footage. All officers in those cases were cleared. Salt Lake County Sheriff Rosie Rivera, who oversees UPD, said she’d like to gather more data on how often the camera footage is reviewed, how much time officers spend downloading and if the department could get more grants to fund expansion. She is supportive of keeping the cameras but skeptical of the budget. “We believe if more grants come through, we can go that route and help pay for body cameras in the future,” she said. Gina Thayne, the aunt of Dillon Taylor, who was unarmed when he was shot and killed by Salt Lake City police in 2014 (a case that was later ruled justified), said watching video of that has brought her comfort. She said it’s clear to her that her nephew wasn’t at fault. Thayne asked the board of directors to consider body cameras to be a standard piece of equipment just as important as a bulletproof vest or a holster. Before the meeting, Sen. Dan McCay, R-Riverton, posted a letter on Twitter asking that UPD keep its body cameras. He’s sponsored legislation in past years on the issue but stopped short of requiring police to keep footage. He said he would consider future bills to help departments with funding. At the meeting, several residents suggested that the department ask the Legislature for more money. Others said UPD should shift around the dollars it has and reprioritize. One man said each officer should have to trade in a weapon for a body camera. Another said other departments in the state are able to use body cameras for less money.